2. 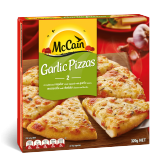 Heat the McCain Garlic Pizza in an oven as per directions on the packaging. 4. To make the dressing, combine the oil, vinegar, mint, salt and pepper in a small container with a tight-fitting lid. Refrigerate. 5. In a large container place radishes, tomatoes, and cucumber, then place lettuce on top. Cover the container and refrigerate until you want to serve. 6. To serve, finish the salad by squashing the cubes of goat cheese and sprinkling over the top. Shake dressing to combine, and pour over salad. Toss and serve with McCain Garlic Pizza. 2 Heat the McCain Garlic Pizza in an oven as per directions on the packaging. 4 To make the dressing, combine the oil, vinegar, mint, salt and pepper in a small container with a tight-fitting lid. Refrigerate. 5 In a large container place radishes, tomatoes, and cucumber, then place lettuce on top. Cover the container and refrigerate until you want to serve. 6 To serve, finish the salad by squashing the cubes of goat cheese and sprinkling over the top. Shake dressing to combine, and pour over salad. 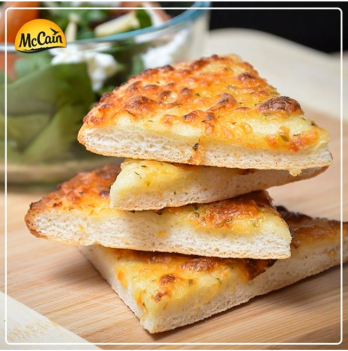 Toss and serve with McCain Garlic Pizza.